I’m praying for you also. Complications — I’ve had more than a few. Same goes for interrupted treatment. No doubt you are well acquainted with the concept that chemo has a downside. I'm sorry that youve been through all that!. Being in the hosptital that long must be espcially hard for a person who's used to being active. And whatever else is going on, a couple of months of inactivity is bound to leave you with shaky muscles. I hope things start looking up for you soon. Hang in there. I feel awful in complaining because I know so many out there are going through the same things. I was diagnosed in July (from out of nowhere??!!) and have been weak, nearly reliant on someone for absolutely everything and on oxygen 24/7....I still just cannot wrap my head around all of this? I have pneumonitis (inflammation in my lungs from either the KeyTruda in my chemo or radiation. Either way, it usually is not treatable and eventually fatal, however I have been on antibiotics and steroids for 4 months so my lungs are about half healed but not enough to allow me to walk with a walker or cane. My oxygen bottoms out as soon as I stand so my mobility is pretty limited. Is anyone on this forum at this stage? How on earth do you deal without losing your mind? I’ll get through this I know I will but it is so, so hard. Thank you for listening. Don't feel bad about complaining! We all need to do it sometimes and right now you have plenty to complain about. i know there are some on these forums who have had pneumonitis and I hope they'll see your post and respond. Consider starting a new topic titled "Pnrumonitis". Maybe others with it will be more likely to see it. Currently what can you do that you enjoy? Watch movies, listen to music, talk to friends (in person, by phone, email? ), draw, color, string beads (one of my favorites)? Having the pre-existing scarring and pneumonia in my lungs has had me on oxygen 24/7 since June. Not the worst thing I suppose however it’s an adjustment to have it on me at all times. My current issue is elevated liver enzymes, not sure why, 6 different specialists had 6 different guesses from steroids to Tylenol to cancer so waiting for those results. I just wish I knew what I can expect, I feel good otherwise but I keep hearing the end result to lung cancer is not promising or accommodating. Hi Candi, Don't believe all you hear about lung cancer prognosis. In recent years, people are living longer and living good lives with lung cancer whether or not they're "cured" . Lots of new treatments are available and more coming out all the time. Keep up hope! I' thinking good thoughts about your liver! After my 3rd thoracic surgery in 4 months, I was on oxygen for 6 weeks. I, like you, had competing complications and time, breathing treatments, and nurse-assisted laps of the ward got me well. I’m betting things will resolve and you’ll wean off oxygen as you recover. I hope it is so. I remember that not too long ago, Tom posted the name and email for someone who helps with tricky cases. Maybe contacting that person would be a good resource for you? I’m scheduled for a respiratory therapy treatment evaluation next week. I’m not sure if it’s the same thing as after your surgeries Tom, but my breathing issues are due to the inflammation in my lungs from the reaction I had to either the radiation or chemo, they are not able to biopsy to know which one. Until the inflammation is clear ( and there is a chance it won’t they tell me) my breathing will be compromised. Scarring from another source has also taken place outside of the cancer which complicates things also. I sincerely hope I am not sounding as frustrating as I feel. We’re thinking of you! Please post an update when you can. my goodness what a difference a little time can make! In one big nutshell I had an MRI of my brain and a CT scan of my chest, abdomen, and pelvis and there are no new signs of cancer and what is seen has shrunk! I now have to see a pulmonologist and begin my chemo again next week. My oncologist was very pleased with the outcome of the tests and I have been thanking God since my appointment yesterday!!! Thank you for checking on me Lauren. Ok.... I promise I won’t make everyone crazy with back and forth posts, I’m kinda feeling that way myself? 😏 lol. As for my tests, scans and so on, things are improving and the cancer is shrinking. My oncologist is pleased but obviously not sharing too much excitement. I was feeling great, a little stronger each day, the last couple of days however, my oxygen saturation has not been staying up where it needs to be (my dr would probably have me back in the hospital if he knew) and to literally sit up takes my breath away and I then need to stay still and recover. Makes me think of the roller coaster ride Tom had mentioned. I’m not sure what to make of it but I suppose I have no choice but to continue on with my chemo they just restarted and hope it resolves the rest of the inflammation thus improving everything else?? Hi Candi, Even if you're worried about your doctor's reaction, you probably do need to talk to him about this soon. This kind of decrease oxygen sats/shortness of breath is not normal. You do need to be able to breathe! Best wishes. I never smoked and drink very little. Work full time as a paramedic for twenty years. But we are all guilty of things. We are also all forgiven equally by God. This is probably our own making as a world of humans. We need to solve it as a world. You are no more or less guilty than another person for our collective world. Some of the best advice I have seen here is be flexible. Not just here but in all things. That's great advice. Best best best of luck my friend. Love you my fellow human and wish you all good things. Oh yes this is the same for me, the scarring in my lungs suggest a chemical exposure but the drs are not sure of the source. Smoking itself does not cause cancer as I understand it, its the failure of exit of dead cells that have split as all of ours do. Cancer is an unfortunate failure of our cell system, however I agree that smoking among other exposures add to the risk. Flexibility is a great piece of advice! And I’m thankful for God’s forgiveness as all are in need. Thank you so much for taking time to respond to my post. God Bless. Also, does anyone know what bronchitis with asperation is? Relax. Don't worry about where you post. We will find you. What is the difference between a nodule and a tumor? Size -- when it is small, it is called a nodule; large it becomes a tumor. Nodules can become tumors. Nodules can and often do stay nodules and are harmless. Nodules in the lung form for many reasons and most are not cancer. 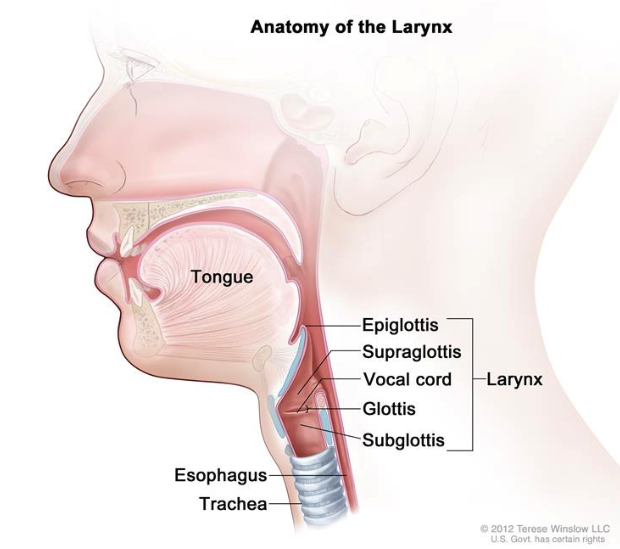 Bronchitis with aspiration (see photo) is literally coughing so hard the epiglottis (the cartridge that seals the trachea from the esophagus) does not seal the airway and one aspirates (breathes-in) liquid into the lung. It is an easy path to pneumonia and it is a serious medical condition. Keep in mind I am not a doctor but you obviously have a lot of coughing going on. You have a history of nodules. I had nodules in my lung that grew when they became cancer and became tumors. But, you are not at that point, at least from the information you shared in your post. If it were me, I'd work with your physician to get your coughing under control. Perhaps your doctor could prescribe an inhaler, or albuterol breathing treatments to treat your bronchitis. Injected steroids have helped me when I've had bad cases of bronchitis. Also, cough medicine can be effective and I use Halls cough drops to suppress the impulse to cough.